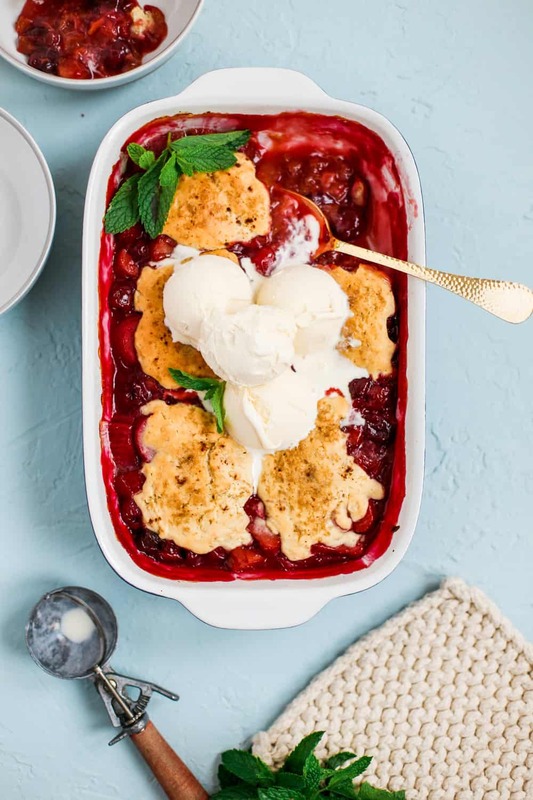 When it comes to easy classic American dessert recipes, you really can’t go wrong with old fashioned cherry rhubarb cobbler. With father’s day around the corner I knew this would be a great fruit filled dessert to serve up on Sunday! This classic cherry dessert recipe has an tarty twist with fresh rhubarb chunks! 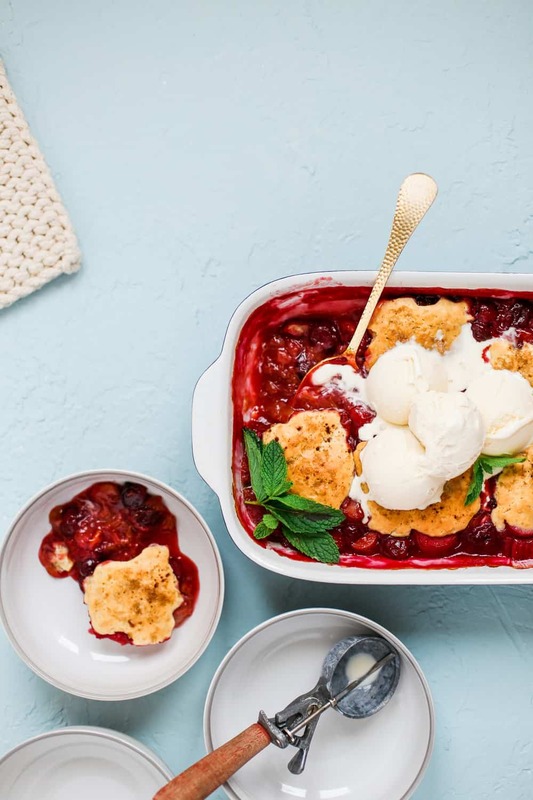 Classic cherry rhubarb cobbler with melty vanilla ice cream is a perfect summer dessert and tasty enough for any dinner party! 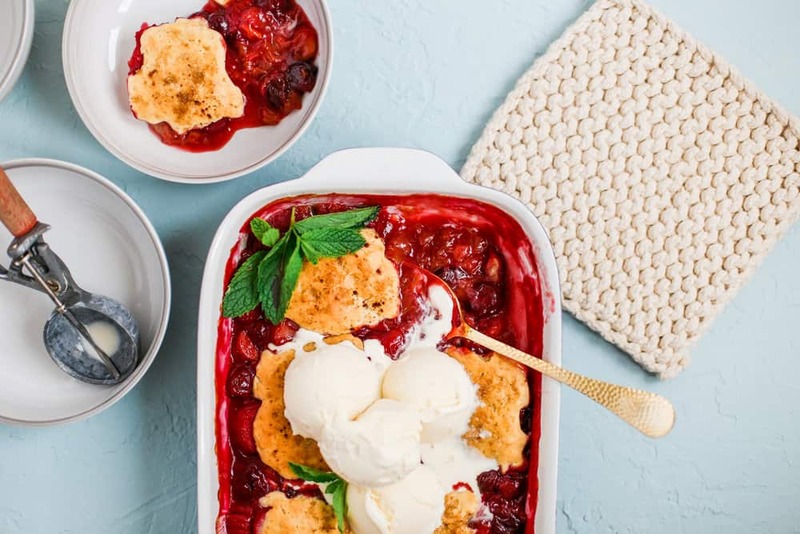 Hello oooey gooey classic cherry rhubarb cobbler. 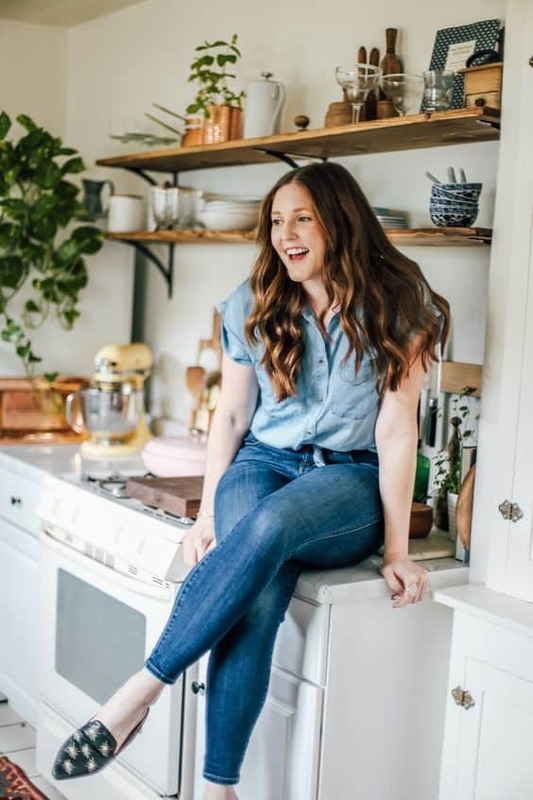 I hope this easy recipe makes your Monday a little sweeter! I usually spend Monday morning’s catching up on emails and creating my to do lists for the week but I also snuck in a little time for some cobbler. With Father’s Day right around the corner, I knew I needed to put out something super classic. I don’t know about your Dad, but if he is anything like mine then they love simple, but tasty desserts. I’m thinking my Dad might also love these pretzels and these cookies might need to make an appearance on Father’s Day too. Although I am 100% not opposed to this because sometimes ya gotta do what ya gotta do, ya know? 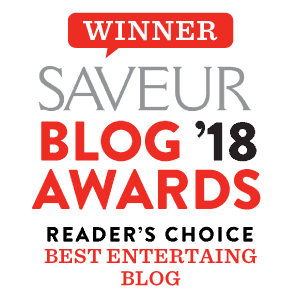 My goal for any recipe on this site is to be scrumptious but also pretty easy! So if you’re a canned pie filling gal like I used to be, fear not! 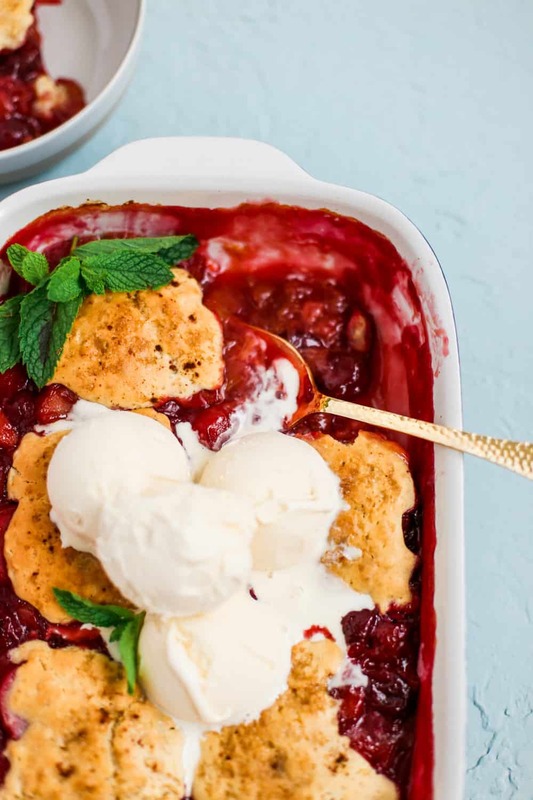 Because you can totally slaaaay this classic cherry rhubarb cobbler. 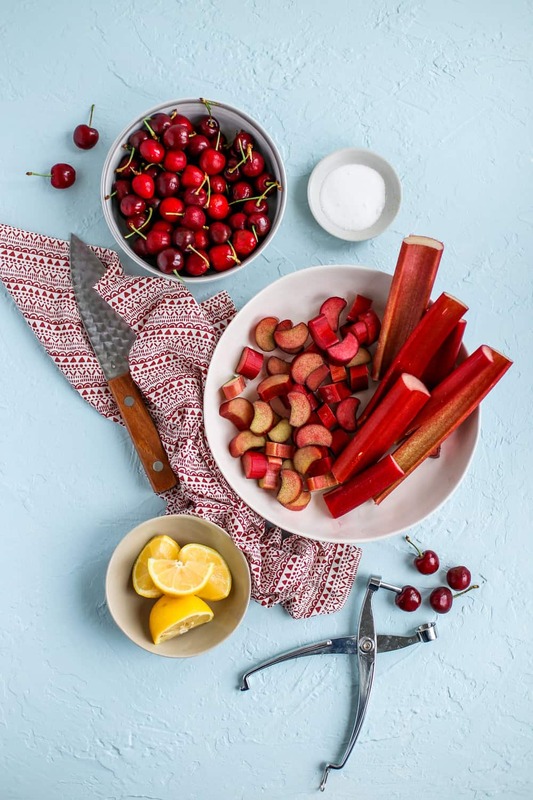 Cherries and rhubarb make for a great combo because they balance out each other’s sweet and tarty flavors. I also just love rhubarb and try to sneak it in whenever I can because the season goes so quickly! You can also use frozen rhubarb if you really have to! The great part about this recipe is it’s pretty customizable. If you love peaches and raspberries or find rhubarb appalling just swap it out with your favorite fruit! The biscuit topping is a simple pastry mixture and sinks in so beautifully into the cobbler! The top is golden brown and flaky and the bottom is like a sponge full of fruit juices. No crisp is complete without a TON of creamy vanilla ice cream. After you pull the dessert from the oven let the cobbler cool for 10-15 minutes. This will let the juices thicken up a bit and won’t turn your entire ice cream pile into soup! You honestly can’t go wrong with this dessert. Such an American classic! In a large bowl combine flour, 3 tablespoons of sugar, baking powder, salt and shredded butter. With your hands or pastry blender combine butter and flour mixture until pieces are pea sized and crumbly. For the fruit mixture combine cherries, rhubarb, lemon zest, lemon juice, sugar, cinnamon and corn starch. Stir well and cook over medium heat until thick and bubbly. Transfer mixture to a greased casserole dish. In a small bowl whisk together egg and milk. Add egg mixture to the flour mixture and stir until just combined. Drop 4-6 biscuits onto fruit mixture and top with extra granulated sugar if desired. Bake cobbler for 20-25 minutes or until biscuits are golden brown. Serve with plenty of vanilla ice cream. Previous Post DIY Wooden Herb Garden Planters for less than $100! Next Post Before & After: Our backyard reveal!